The voting has ended and the majority of people who commented or sent emails said "no lines." This is the final product and I love it, I really like how soft and dreamy it looks. Hope you enjoy. I'm hoping to have another one tomorrow night. I love driving on the rim of upper Canyon Road. Such beautiful homes tucked away on that ridge. This gate was so beautiful, the carving was a sunburst design. My little painting doesn't do it justice, but I like how it turned out. Tomorrow I will be starting something new until November 20. Each painting up for auction will be listed for 5 days instead of the usual 7. I will have one new painting every 5 days in order to give me time to create lots of new work for Weems Artfest in November. I will also be posting photos of paintings I'm working on for the show, so if you see something that strikes your fancy, email me and I will give you purchase information. I'm getting excited. I have so many sizes and ideas jumbling my brain that I feel like I could paint forever! Sorry, this posting is a tad late! This is a commissioned painting that I finished tonight. I also worked on a daily painting and I will post that tomorrow. 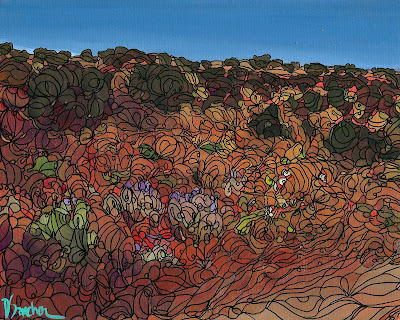 Tomorrow night I'm attending a fundraiser and I have donated a 30"x40" piece that looks very similar to the one above. The outlining process on a large painting like that with so much detail takes an incredibly long time. I have a deadline of August 31st on another project I'm working on, so I will be busy, but I'm trying to keep up with the daily paintings too. There are two paintings tonight; one lined and one unlined. 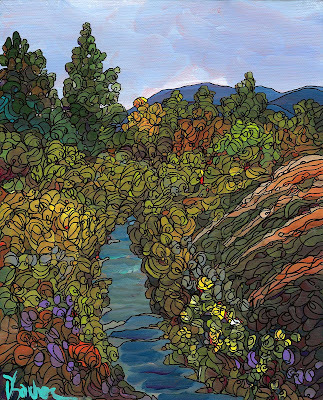 This painting is from a trip I took with some other artists and we found this hidden stream on the Velarde rim near Taos Ski Valley. It was beautiful but really hot outside so I just snapped photos with the idea of creating a painting later in my studio. Tonight's painting is a request from my daughter. No lines. She clipped a photo from a magazine and she thinks it was a Van Gogh, but she's not sure and I didn't have time to research. She just finished distressing an already-old trunk and this painting will look very pretty above it. She has one more on her list and has a one track mind about it. If I do it tomorrow, maybe I can then get some REAL work done! On my way back from Santa Fe, I spotted this nice little scene between the villages of Cerrillos and Golden. The clouds were incredible that day. I just pulled the car over and painted beside the road. 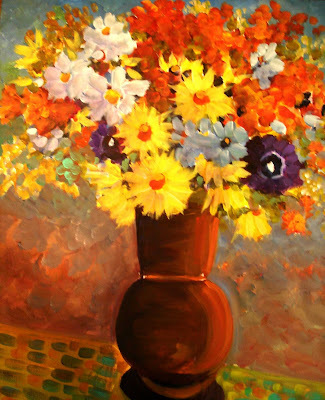 The paintings were so quick that I knew I would come home and finish them in the studio. 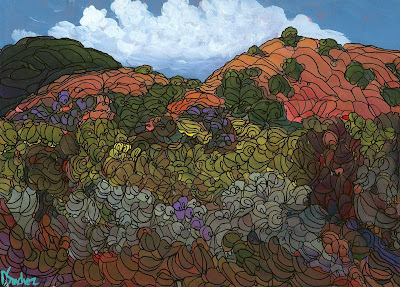 I finished my last commission today - now it's on to painting for "The Gardens of New Mexico" in October and "Artfest" in November. Tomorrow I hope to have another daily painting for you, but first, I'm going to clean my studio (AGAIN). 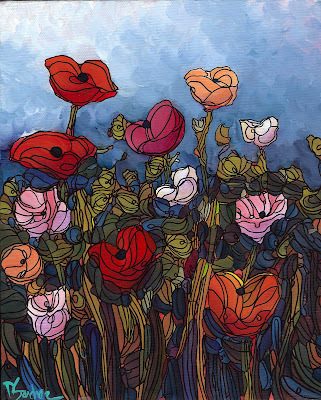 I haven't painted my poppies for a while now. These paintings just seem very peaceful and calming to me, almost like a meditation break. 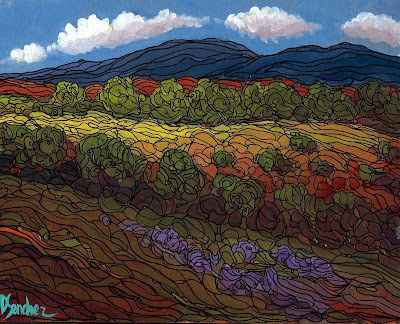 I will be in a show at Sumner and Dene Gallery in Downtown Albuquerque in October. The show is called "Gardens of New Mexico." I will be exhibiting six paintings from small to large, so I thought I'd better start practicing. Hope you like this one. 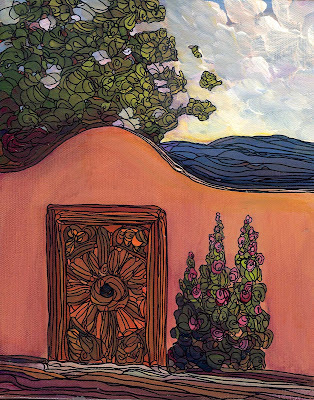 Painted on location in the heart of the beautiful art district of Canyon Road in Santa Fe, New Mexico. I don't get a chance to paint plein aire very often so this one is special. It started pouring rain right in the middle of my painting, so part of this was done in the front seat of my car with my paints in the passenger seat. I will offer it for auction for five days only. Bidding starts at $225. You also have the option to purchase outright for $225 and bypass the bidding process if you like. I hope someone falls in love with it. I love this little painting. 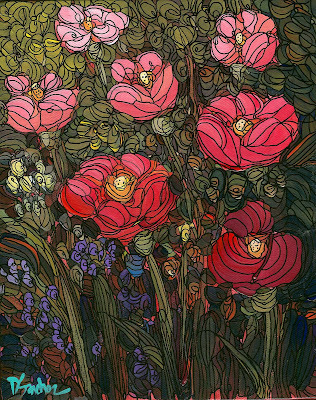 I love all of the colors flowing together and the touches of red. I like the feel in the background of the hazy sky. 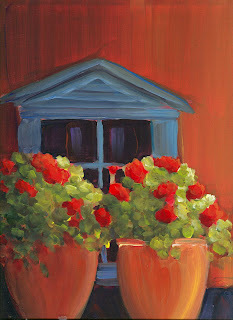 Tomorrow I will offer one of my plein aire paintings up for auction. I thought about taking it straight to the gallery but I thought maybe one of you might want to snap it up! You can go back a few spaces on my blog to preview. 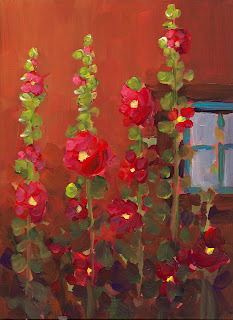 It's a painting of hollyhocks against an adobe wall on Canyon Road. This is my lastest plein air with lines. I know I said I was going to offer it without, but I got excited and forgot! 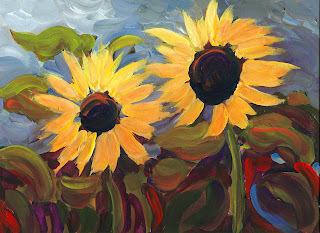 Today I am super-cleaning my studio and tonight I hope to have a new sunflower painting for you. I've also added a feature to my ebay auction - a "BUY IT NOW" button if you choose to purchase a piece and don't want to wait for the bidding process. 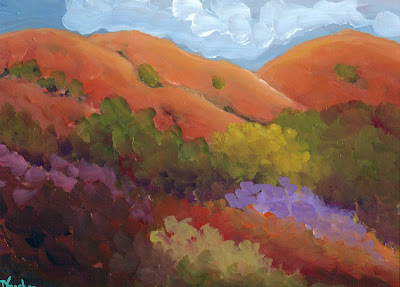 This is a plein air painting I did from a little dirt road out in La Cienega. The only reference point for me was a little white water tower where I was painting. I was really afraid I was lost and wouldn't be able to find my way back. This painting was done so quickly that I feel it's not ready yet. I will add shadows and highlights and post it on ebay with no lines. If it hasn't sold in 4 days, I will add lines. And if it still doesn't sell, I may just keep it! My computer miraculously repaired itself and I'm back in blog land. I have missed it, for sure. 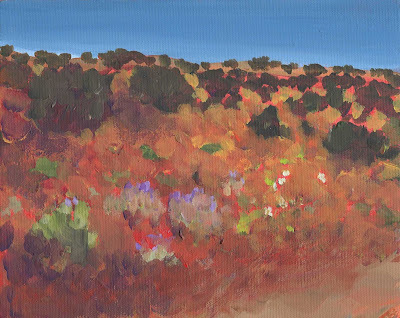 This is a painting I did out on location on a little dusty dirt road in the village of Galisteo outside of Santa Fe. Everyone wanted lines in it, so I added them. I like it, but I also like the soft look of "unlined." I have load of images in my camera and in my head, so you'll be seeing lots more. This painting is up for auction on ebay. Hope you enjoy and thanks for watching. Thanks to all of you who commented and emailed me when I was offline to keep me inspired. I am sorry this is taking so long! A big lightening storm knocked out my broadband modem. I got it replaced today and my web browser sites still aren't working. They think my computer may have a component damaged. So, I have called my computer guy and hopefully I will be up and running shortly. I am on my daughter's computer. You really don't realize what you have until it's gone! Well, I finished up my aspen commission and am working on another 24'x48' aspen with clouds. This one doesn't require lines so I hope to finished by Sunday. 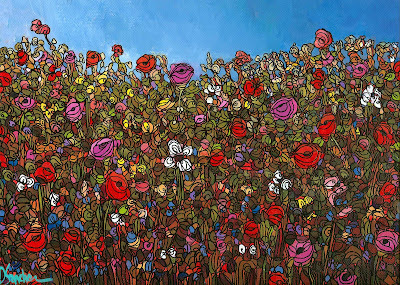 I am also outlining a 30x40' poppy field painting for a benefit at the National Hispanic Cultural Center in September. That one should be done tomorrow. 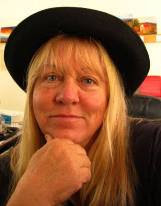 Then I am taking a couple of days off to clean my studio, house, etc., and get ready to start working on Weems Artfest. Time flies when you're having fun. I have a painting ready for auction but can't post it until my computer is fixed, so please bear with me. Have a great week! Hi Everyone.....Due to technical difficulties (and a lightning storm) Dee's internet connection is down. She will be back on line tomorrow (the 7th of August) with a new painting. This painting began on location but I didn't have time to finish it. I will complete it and put it up for auction tomorrow night. Question is: should I leave it unlined or put lines? Send me your comments or emails and majority wins! 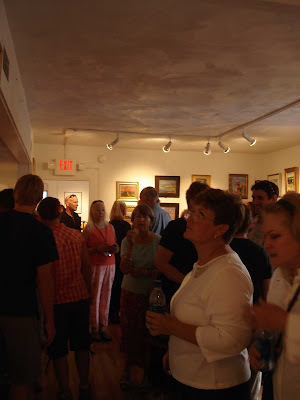 I will also post pics of the opening in Santa fe tonight. Here they are - the finished pieces for the show! It was so fun, I painted on Canyon Road all day yesterday. I even painted in my car for awhile because there was a pretty good rainstorm in the afternoon. 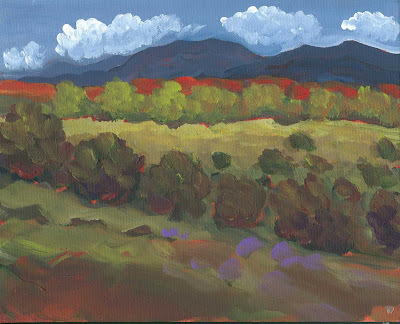 I have framed the paintings and will make another trip to Santa Fe today to drop them off. As you can see, these paintings have a different feel than my studio work. I like how soft they look and there is no line work. Mixing colors out in the sun just makes everything look so warm. I will be at the opening reception tomorrow night. I would love to see everyone. 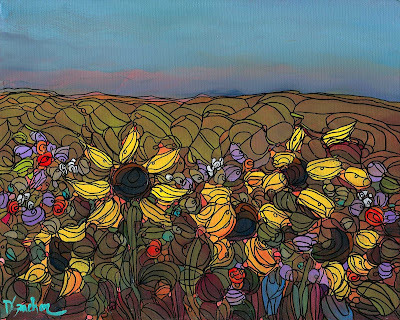 There will be approximately 180 paintings on exhibit from 60 artists. Come see me! Email me for directions. I am headed up to Santa Fe again today. Looks like rain but I will give it a try. 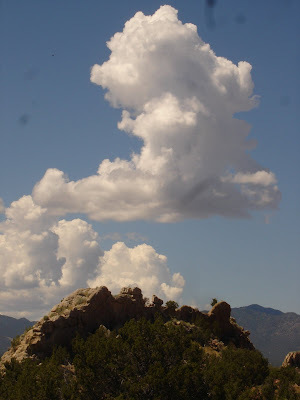 This formation is along NM14, the backroad between Santa Fe and Albuquerque. It almost looks like smoke from a fire. I thought it was absolutely beautiful. I will try to have another post for you tonight.